What image size should I use for sharing my web site to Facebook? 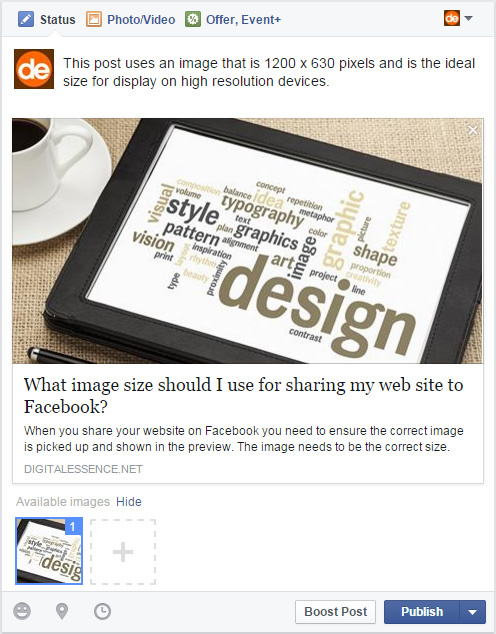 What image size should you use for your Facebook preview image? 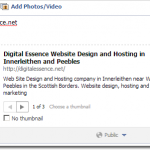 When sharing your web site or blog on Facebook you want your post to look as good as possible to help with engagement. A good quality high resolution preview image is key to catching people’s attention and hopefully encouraging them to like, comment and share. In our mini-series on How Do I Force Facebook To Use A Thumbnail From My Website? we showed you how to force Facebook to display the correct preview image with use of the og:image tag in the header. If you haven’t read our guide or set up og:image then we suggest you head over there now. In this post we are moving on to what Facebook image sizes to use to make your post look as good as possible. If there’s one thing you take away from this post it should be 1.91:1. That is the width of the image you share should 1.91 times the height. Sticking to this Aspect Ratio, all of your images will scale nicely across the Desktop News Feed, Mobile and Sidebar. What size should my image be to share on Facebook? Facebook recommends you use images that are at least 1200 x 630 pixels for the best display on high resolution devices. This image size is best practice and unless you have a high resolution image it’s not going to be practical. So the next best image size to use is 600 x 315. We’ve done some extensive testing and found that despite what Facebook says in its best practices for sharing, an image smaller than 600 x 315 didn’t show any preview image. This is an example of an og:image 1200 x 630 pixels in size. The ideal image dimensions according to Facebook. It displays well on all devices. We then tested a 630 x 315 image and found little difference in resolution on the desktop. Going one step further we then used an image smaller than the recommended 600 x 315 but still using the 1.91:1 aspect ratio and we found it didn’t display at all. This is contrary to what Facebook state and an important note. To all intents and purposes. The minimum image size you should aim for is 630 x 315. Has this helped? Are you now seeing high quality thumbnail images when you share to Facebook? Share your thoughts in the comments below! I’m not sure when this post was written, but I’m writing this in May of 2016. I got to this post from “How Do I Force Facebook To Use A Thumbnail From My Website?” (which I found very helpful – thank you). I did not experience the same issues you describe with images smaller than 630×315 not appearing (e.g. I was able to get an image of 525×275 to show fine). I also noticed that the Facebook Sharing Debugger doesn’t render an accurate preview. I spent hours testing with the debugger to try to get the composition of my image to be centered. I finally got so frustrated that I decided to test it with FB and found that the image was getting centered just fine. So I recommend using the debugger to “Scrape” so you know it’s using the image you expect, and then actually test generating a preview on FB by typing in the URL you are trying to share. Your suggestion to just use the debugger to scrape any changes and then test in FB is a good one. We will go back and re run everything and see what happens.